A very busy day began with a chilly morning wakeup in the teepee. We combined possessions, loaded up the bike, and set out for Jackson, WY on rt 33. What a great ride! 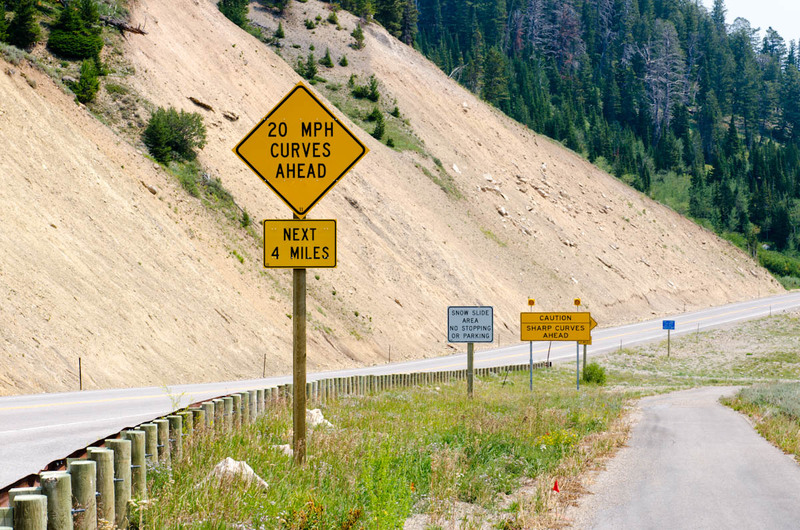 It as full of long and twisting climbs into the mountain passes, reaching over 8000' before descending again to the valley of Jackson. Jackson, WY is a beautiful town that looks like it's just waiting for the winter snows. The buildings are typically made from thick logs with good strong roofs that look about as awkward as wearing a wool sweater in July. We grabbed lunch at a cafe with a view of the mountains that ringed the valley... only they weren't there. The air was, according to the locals, as hazy as they'd seen it in years. The horizon just sort of melted into a soupy gray where you could just barely make out the rise of the land. Smoke from the Idaho wildfires had filtered into the basin to the point where you had to blink a lot to dispel a gentle stinging sensation of the eyes that sort of hovered at the edge of consciousness. After the better part of a week spent cruising around Rapid, I was itching to head west again. I've never seen the Rocky Mountains before and one of my major trip goals is to spend a lot of time exploring them from Utah up through Idaho. So I was pretty excited when I finally saddled up and set out towards Wyoming on rt 16. First I had about 70 miles to cover through the Black Hills, which was more or less familiar territory at this point. What I didn't expect as I rolled towards the "Forever West" state were the acres upon acres of desolate hilltops ravaged by the Jasper Fire of 2000. One carelessly dropped match had torched 83,500 acres of forest and left the hills as wide open expanses of gentle grass dotted with the matchstick trunks of trees that refused to burn to the ground. It was an eerie sight after being among the dense ponderosa pines of the previous 50 miles. I saw the Black Hills for the first time when I came to visit my girlfriend's family this past March during a record-setting heat wave. The snow had melted but the lakes were still frozen and there was no one at all on the road when we drove up to Sylvan Lake for pleasant summer-like hike. The Needles Highway, which begins at Sylvan (6000' elevation), was still blocked off for the season (standard procedure during winters that don't hit 80 degrees up there). Other than the temperature, my second visit couldn't have been more different. The snow was melted and the contemplative quiet of the hills was broken by the roar of a thousand motorcycles crawling around the 15mph curves towards the famous Needles Highway. I took my place among them, eager to see the prize I'd been unable to claim my first time around. 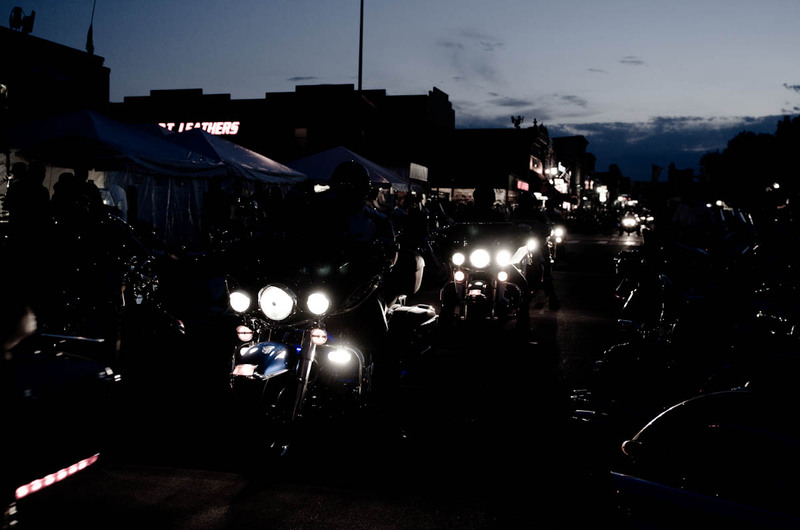 Sturgis is the largest motorcycle rally in the US and it lasts for more than a week. For days and weeks before it even begins, the roads over 300 miles away are clogged with bikes and trailers and RVs. I've seen a Sturgis 2012 shirt on north of 80% of the other bikers I've met since I left South Dakota. It's like prom for bikers. We rode out to the town of Sturgis, SD to see what all the commotion was about. After a crush of heavy traffic on the way in, we were able to park along the main drag downtown amidst the roars of 100 motorcycles and the smells of fried food and rampant consumerism. Every shop on the strip is packed full of branded merchandise. One member of our party broke her flip-flop and was dismayed to find the only options for replacement cost over $40. It's been a long time since I could accurately remember how old I am. 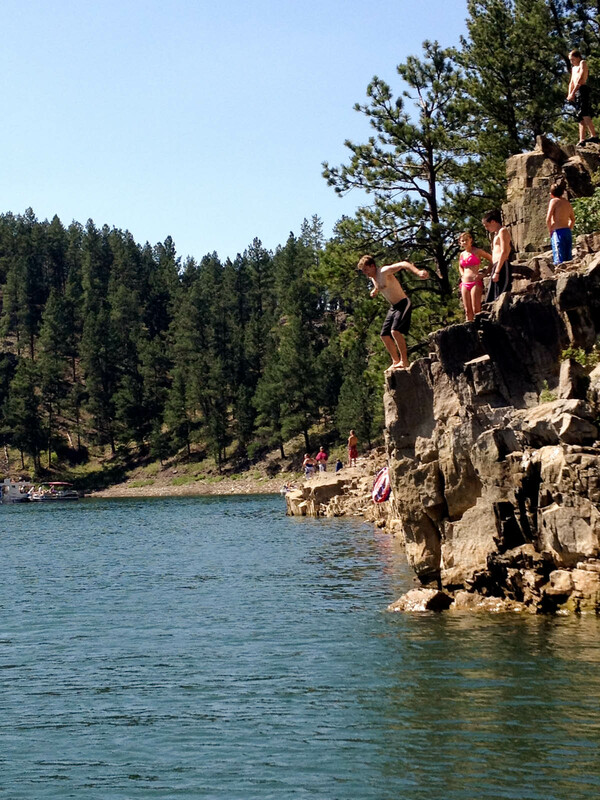 I celebrated another of those increasingly meaningless milestones in good Rapid City fashion, starting with a local brunch and a trip to the Jenny Gulch on Lake Pactola in the Black Hills. It's a spot where local teenagers go to show their total disregard for personal safety by drinking and jumping off the cliffs. I may be getting old, but I don't turn down a good challenge and it was a fun time all around. The black hills are absolutely gorgeous and it was great to get out in the sun and on the water for a day. I had noticed on the way in from Sioux Falls to Rapid City, just at the left edge of sight, that the land took a turn for the strange. It looked like the plains just kind of disintegrated at the jagged edge of the horizon into some great unknown. My girlfriend had told me about the Badlands and I was dying to check them out. I finally got my wish the day after my birthday when we rode 70 miles out of Rapid in the morning to the small town of Wall, SD where route 240, the Badlands Loop, began. The Twin Cities of Minneapolis and St Paul are in some ways like midwestern versions of Boston -- fairly well populated but still retaining some of that small-town charm. It's an area that got its start due to the early economic potential of the Mississippi River, grew strongly during the Industrial Revolution, and struggled to redefine itself as a modern city in the late 20th century. We started our half day in town with a slow riverboat tour down the Mississippi to learn a bit about the history of the area and to take in the local scenery. The experience was high on leisure but a bit light on history. We did see the cave where Pierre Pigs-eye Parrant, the bootlegger forefather of St Paul, set up the operation which eventually evolved into the first settlement. We paddled down to where Fort Snelling sits high atop a bluff before turning around. Indiana and New Jersey must be in cahoots because they've both got a pretty good racket going in the toll roads business. The ride from Toledo to Chicago ended up costing over $15 and that was far less than it would have been for a car. Indiana tolls were quickly replaced with Chicago parking fees. A few years ago, apparently Morgan Stanley bought the rights to run the meters and the rates have gone nowhere but up since that particular deal went down (and MS absolutely crushed it on the contract). Fees aside, I really enjoy Chicago. It is almost exactly the same size as Houston by population but they couldn't be more different. Chicago is like New York on the Great Lakes -- great skyline, lots to do, and vibrant energy all around. It feels like, to me, a real city should. The quality of life there, when it's not below-zero and windy, is pretty darn good. Houston, on the other hand, has achieved its population growth through expanding the boundaries of its sprawl and its downtown feels like an afterthought. Were it not for the soul-crushing winters, I could easily find an excuse to relocate to the Windy City. My ride to Toledo was unremarkable. The poor scenery of Indiana almost immediately improved upon crossing into Ohio, where it transitioned into a more generic sort of flat commercial farmland. I met my girlfriend at my grandparent's house in Toledo and we all caught up over some steaks while watching the Olympic opening ceremonies. Despite my fear of being completely disappointed after the extraordinary synchronized display at Beijing '08, London '12 did a pretty good job of keeping things on a personal level and I have to credit them for putting together a good followup production. The highlight of Saturday (aside from pecan pancakes and Buckeye iced cream) was the visit to the Toledo Firefighter Museum. It's a tiny building on the outside but the inside is packed with a very well preserved collection of historical fire engines, artifacts, and memorabilia. We were toured by a retired firefighter who clearly loved the job and walked us through the growth of firefighting technology and the industry itself with a deeply personal touch. The day I left Glasgow, another chain of storms had begun tearing its way through the upper midwest. The weather forecast for Indianapolis showed trouble brewing in the afternoon so I headed out with the sun still low in the morning sky and only a gentle humid warmth hanging in the air. Louisville, KY is the most "city-like" place in Kentucky, and the ride north on I-65 through its surroundings was understandably less picturesque than the horse farms of Lexington had been. Indiana continued that sorry trend. I passed the loose blend of farming, housing, and industry of lower Indiana, through the relatively uninspiring downtown of Indianapolis (that's not just because I'm a Patriots fan) and headed west past a lot of industrial areas to the racing mecca of the Indianapolis Motor Speedway. At this point the temperature approached triple digits and the clouds hung ominously in the sky but I figured that I couldn't pass through without seeing such a storied facility. On Tuesday my uncle, cousin and I took a trip to the nearby Mammoth Cave National Park. One of my goals is to see the best national parks along the way and the largest cave in the world (390 miles discovered so far) would certainly meet that criteria. The drive out there passed through Cave City, one of those 1960's style kitschy tourist trap towns that has been holding on by a thread ever since. We passed the dilapidated remains of everything from bumper boats to redneck golf. And, of course, Dinosaur World. It was often hard to tell which attractions were still operational due to the general state of disrepair of all around.